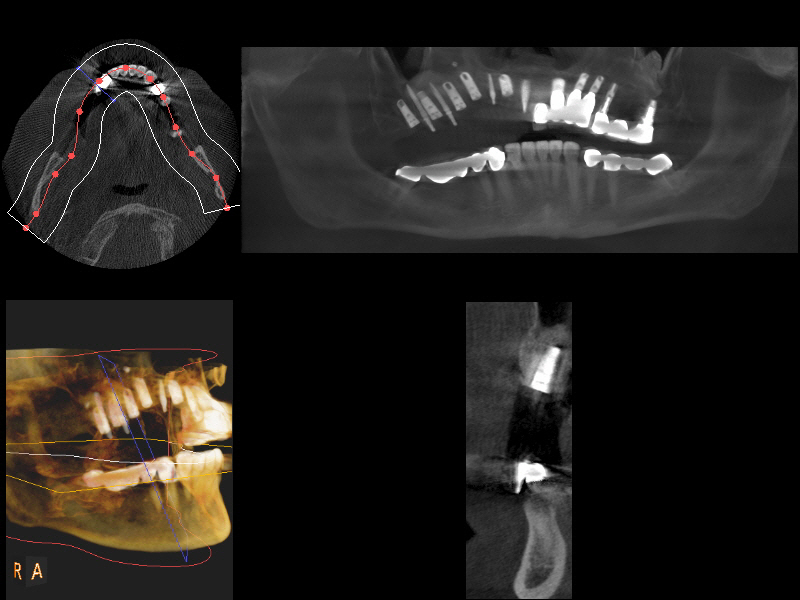 Cone beam computed tomography (commonly referred to by the acronym CBCT) is a medical imaging technique that has become increasingly important in treatment planning and diagnosis in implant dentistry, among other things. Perhaps because of the increased access to such technology, CBCT scanners are now finding many uses in dentistry, such as in the fields of oral & maxillofacial surgery, endodontics and orthodontics, as well. [Cone Beam CT is] a compact, faster and safer version of the regular CT. Through the use of a cone shaped X-Ray beam, the size of the scanner, radiation dosage and time needed for scanning are all dramatically reduced. A typical CBCT scanner can fit easily into any dental (or otherwise) practice and is easily accessible by patients. The time needed for a full scan is typically under one minute and the radiation dosage is up to a hundred times less than that of a regular CT scanner. The KODAK 9500 Cone Beam 3D System was introduced by Carestream Health, Inc., for easy-to-use three-dimensional imaging of cranio-maxillofacial anatomy. Built on the proven and reliable KODAK 9000 platform, the KODAK 9500 3D System enables users to quickly produce magnificent 3D images, ranging from dual jaw to full craniofacial images, more affordably and at a lower dose than traditional medical CT systems. At our office we have chosen the Kodak 9500 in place of the Cone Beam CT in order to provide a better service and a more thorough evaluation of the patient’s mouth with a low dose of radiation. During a CBCT scan, the scanner rotates around the patient's head, obtaining up to nearly 600 distinct images. The scanning software collects the data and reconstructs it, producing what is termed a digital volume composed of three dimensional voxels of anatomical data that can then be manipulated and visualized with specialized software. Carestream Dental strongly believes that technological advances in our digital imaging systems have significantly increased the level of detailed clinical information available to oral health practitioners while mitigating the level of patient radiation exposure. One of the most important innovations in dental diagnostics has been the advent of cone beam computed tomography (CBCT), which has proven effective for many applications in oral healthcare. CBCT is a technology that is considered by some to be the standard of care where 3D imaging is necessary in dentistry. 1 This technological leap allows practitioners to gain immediate access to accurate 3D images of anatomical structures, which often are critical to precise diagnoses, more effective treatment planning and increased case acceptance. Carestream Dental believes that, as CBCT is adopted by more practitioners, it will continue to provide numerous benefits for practitioners and patients, including improved outcomes; reduced need for exploratory procedures; improved treatment predictability; reduced morbidity; and potentially lowered cost and time savings. Throughout all customer outreach, education and communication materials, Carestream Dental reinforces that any use of ionizing radiation should only be used when and where it is indicated. We recommend patients should always be informed of the potential risks, benefits and alternatives. Carestream Dental also advocates adherence to the ALARA Principle, or "As Low as Reasonably Achievable," which dictates that every precaution should be taken to minimize radiation exposure. While oral health professionals have long relied on 2D imaging for diagnosis and treatment planning, this technology typically requires multiple exposures and, with them, multiple doses of radiation. With a properly prescribed 3D scan, practitioners have gained the ability to collect much more data – often with a single scan and potentially with a lower effective patient dose. Carestream Dental is committed to educating oral health practitioners about the benefits of CBCT technology and how to use it safely for the maximum benefit of patients. The company regularly sponsors education on 3D imaging, such as the recent 3D Symposium event, "The Right Image for the Right Task: Managing Dose and Risk in CBCT Imaging," presented by Dr. John Ludlow from the University of North Carolina School of Dentistry. The company also works closely with various academies on their professional training initiatives, and is the primary corporate sponsor of the American Academy of Oral and Maxillofacial Radiology. I want to take this opportunity to thank you for the excellent care and attention given to me during my office visit. I really appreciate your kind consideration and review of my medical condition. The time taken to explain to me the various options and your expert opinion is greatly appreciated. You have demonstrated to me your wisdom and knowledge of the profession. Once again, thanks for helping me and giving me high quality care and attention. I will write to you with warm and sincere thanks for extracting my wisdom teeth. I must say that you exemplify a superior level of professionalism, proficiency and confidence when you work. I was initially very apprehensive at the start of the procedure. However you and your staff were able to relax and provide me reassurance. You performed outstandingly and for that I am very grateful. Please know that I will proudly recommend you to anyone that I should encounter who may require your services. You exhibit truly iconic poise and are a model to be replicated. Despite this, I do sincerely hope I never have to see you again. Once more, my deepest thanks and best regards.